Before learning about BrightStar, Jim Logan watched his wife, Kathy, experience the stress of finding the right caregiver for her mother. Mom was beginning to lose her short-term memory and Kathy worried that Mom was no longer safe living alone. But, finding a trustworthy caregiver was frustrating. One caregiver wasn’t the right fit, another walked out on Mom without notice and the strain on family began to swell. The emotional toll on Kathy, her mother and the family was crushing to watch, and Jim set out to do something about it, both for his own family and for others facing the same difficult challenges. 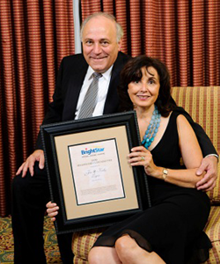 Now, as the local owners of BrightStar in Orland Park and Will County, Jim and Kathy provide peace of mind with the highest quality healthcare staffing solutions for families and businesses. Their dedicated staff is committed to Making More Possible for patients of all ages with compassion, dignity and respect. Kathy Logan is a career healthcare professional. A graduate of Indiana University, Kathy worked as director of health information for Swedish Covenant Hospital - Chicago, IL. She also served as an adjunct professor in Health Information Science at the University of Illinois at Chicago, and as practice manager for several physicians’ groups and offices in the Greater Chicago-Land area. Jim Logan earned his MBA from the Kellogg Graduate School of Management at Northwestern University and worked as an information technology professional for manufacturing and pharmaceutical companies. Later in Jim’s career he caught the entrepreneurial bug and opened his own computer consulting practice. He spent his energies on solving business problems and building computer solutions for pharmaceutical companies and a variety of other firms. He credits the Rotary Club with helping him to discover the joy of helping others, something he gets to do every day with BrightStar. Jim and Kathy have been serving families in and around Will County since 2007. They look forward to continuing to grow a business where together, they bring a strong sense of community and a strong desire to help others to every aspect of their BrightStar business. They measure their success by the hugs they receive from the people they serve and their families — the best rewards of all! Please contact us online or call our Will County offices at (708) 226-5100 and we'll be happy to answer them.